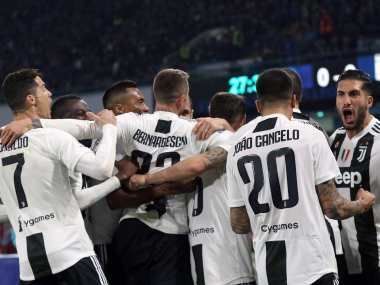 Rome: Juventus closed all talk of a challenge to their Serie A dominance after coming through a second-half onslaught at Napoli to win 2-1 in an engrossing match that saw each side have a man sent off and stretch their lead at the top to a huge 16 points. 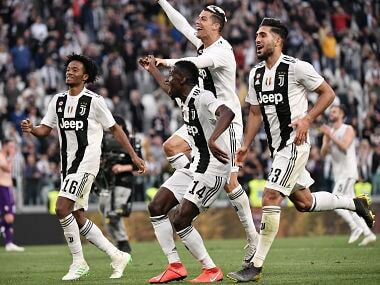 Massimiliano Allegri's unbeaten leaders have now as good as sealed their eighth straight Serie A title after a match that looked dead at half-time with Juve two goals and a man up, but sparked back into life when goalscorer Miralem Pjanic was sent off for handling a Napoli pass and picking up a second yellow card just after the break. "I fell asleep, I should have replaced Pjanic when he had the first card. He was at risk, but I didn't expect him to handle," said Allegri, whose future at Juve is uncertain after what will be five seasons in Turin. "I already said we'll sit down to talk about this season and the next. I am very happy to be at Juventus." 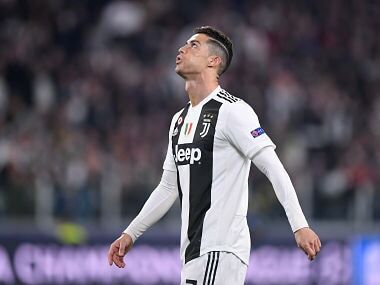 Midfielder Pjanic swept home his free-kick opener in the 28th minute, which came immediately after Napoli were reduced to 10 men thanks to goalkeeper Alex Meret slicing down Cristiano Ronaldo after the Portuguese nipped in to intercept a terrible Kevin Malcuit backpass. Emre Can added the second from a corner 11 minutes later after substitute David Ospina tipped away Pjanic's stinging shot, but the Bosnian's red card gave Napoli a glimmer of hope. They were back in the game in the 61st minute when Jose Callejon tapped home a pinpoint Lorenzo Insigne cross, and then piled the pressure on a suddenly creaking Juve, with Piotr Zielinski twice forcing fine saves from countryman Wojciech Szczesny. 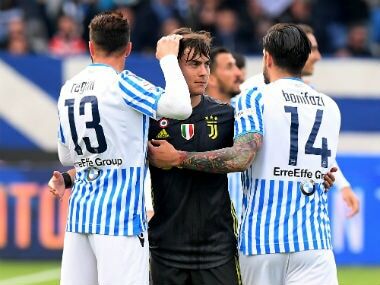 It looked as though the hosts were set to launch a final assault when they were given a penalty six minutes before the end for a controversial handball decision against Alex Sandro given by VAR, only for Insigne to crash his spot-kick against the post and let the champions off the hook. As elsewhere across Serie A this weekend, play at the Stadio San Paolo stopped in the 13th minute to honour the memory of deceased former Italy international Davide Astori, with fans of both sides applauding the ex-Fiorentina captain, who died in his sleep aged just 31 on March 4 last year. Astori's name was chanted by fans of AC Milan, where he came through as a youth player, during a 1-0 win over Sassuolo on Saturday that took Gennaro Gattuso's side third and a point above Inter, who lost 2-1 at Cagliari amid a public contract dispute with absent star striker Mauro Icardi. But the most emotional scenes came during Fiorentina's 3-1 defeat at Atalanta, who kept their hopes of Champions League football alive thanks to goals from Josip Ilicic, Alejandro Gomez and Robin Gosens. Atalanta playmaker Ilicic, who played alongside Astori at Fiorentina, broke down in tears when played stopped, while away fans held up "Astori" signs and the home fans showed appreciation for a player born and raised in the province of Bergamo, where the hosts are based. "This situation has taken over a huge part of us this week. Tomorrow we will close to his family as we have been for the last year," said Fiorentina coach Stefano Pioli. Gian Piero Gasperini's flamboyant Atalanta are six points behind fourth-placed Inter Milan after winning the second spectacular clash with Fiorentina in a matter of days after their thrilling 3-3 Coppa Italia semi-final draw midweek. They are level on 41 points with Lazio, 3-0 winners over Roma in Saturday's Rome derby, and Torino, who beat rock-bottom Chievo by the same score on Sunday. 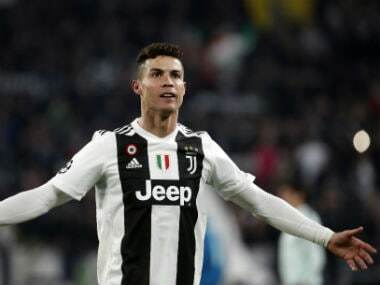 Two points further back are Sampdoria, thanks to 36-year-old Fabio Quagliarella joining Ronaldo at the top of the scoring charts with 19 goals following a brace in his side's 2-1 win at struggling SPAL. "I don't feel like anyone special," said modest Quagliarella after the match. "I'm not the star man, I'm part of a team that works towards a single objective, everyone is useful and no-one is indispensible."